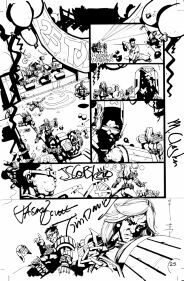 The band have signed Jock's original artwork page from the comic, and also a copy of the magazine it appeared in (Prog 1280, fact fans), and the whole lot will be auctioned on Ebay (www.ebay.co.uk ). All proceeds from the auction will be going to Amnesty International, who were the charity of choice for the 25th Anniversary event, so the final buyer of the art will be helping a good cause as well as getting their hands on a unique piece of memorabilia. In addition to Pitchshifter, the page features Judge Dredd, Judge Anderson and Lenny Zero. Jock has drawn several Judge Dredd covers and his artwork will hopefully soon be seen on a Judge Dredd skateboard. The current issues of 2000AD have his artwork on Tor Cyan (who's connection to Rogue Trooper is being explored). 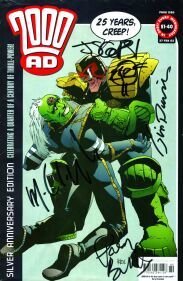 The page was scripted by Lenny Zero's co-creator Andy Diggle (former 2000AD editor, currently working with John Wagner on an Aliens vs. Judge Dredd crossover). The artwork itself is on a 30 x 45.5 cm piece of card, and the total package weight is just over 400 grams. The cover of the signed prog is slightly damaged (which comes from asking the band to sign it at a party). The auction should start on Monday 8 July (sorry for the delay), and will run for ten days. The signed artwork and magazine will be posted on www.ebay.co.uk, and will be available to Ebay users worldwide (buyer pays postage). Check back here on next Monday for the direct link. Matt Smith, editor of 2000 AD, says, "With 2000 AD being one of the few British comics to reach its Silver Anniversary, this is a zarjaz chance for Squaxx dek Thargo to grab a piece of genuine comics history. And as the proceeds are going to a worthy cause, I expect to see bids coming in faster than Dune Sharks in a feeding frenzy!" JS Clayden, lead singer of Pitchshifter, says, "I've read 2000AD all my life. I still read it. To be immortalised in its pages is the biggest and most flattering thrill you could get. Playing their 25th Birthday bash was a great honour and one of those once in a lifetime things I will never forget. When the guys at 2000AD said that they'd like us to sign the original artwork featuring us from the 25th Anniversary edition of the comic, we jumped at it. Amnesty International is a worthwhile organisation and if we can anything to help them and make the world a better place it can only be good.". Pitchshifter's awesome new album 'PSI' is available now and will rock your world like a bad-tempered ABC Warrior, and 2000 AD is available weekly from all good newsagents and comic shops, or by subscription from www.2000adonline.com.